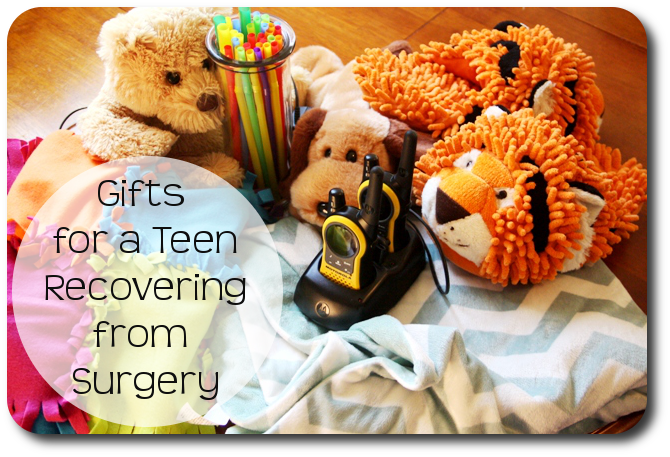 Based on Emma’s experience with her spinal fusion surgery and the long recovery, I am sharing the best gift ideas for a teen in the hospital. We were asked dozens of times what she would like. But it took going through the surgery to know the best gifts for this situation. Of course, the week in the hospital is mostly a blur. For a major surgery like spinal fusion, the patient doesn’t need nearly as much attention as the caregivers do. The biggest blessings we received were food. Dear friends drove to the hospital with hampers full of tortilla wraps, fresh fruit, raw vegetables, nuts, ground coffee, and half & half. Others brought hot food such as fried chicken or pizza. Another friend let me borrow a huge quilt that was in her van. Although the hospital let us use cotton blankets, it felt so homey to have a “real” blanket. INSIDER TIP: It may come as a surprise, but people in the hospital may not want visitors. The hospital is not a comfortable place for socializing. The patient is in terrible pain and not at her best. Entertaining guests is an added stressor for an already stressed patient and family. Express your love and concern, but don’t insist on visiting the patient. Deliver food to the lobby areas and make your stay brief so that parents can get back to the recovering child. Always call before appearing at the hospital room’s door. And be willing to stand in the hallway to chat if the patient is not up to a visitor. To be honest, the patient may not even remember you came. But the family will. So minister to them instead. The patient is hardly able to read a card or enjoy any kind of gift in the hospital, so save those things for the recovery at home. We found that the initial outpouring of concern dropped off quickly once we had been home for about a week. Ironically that time frame was when we could have used more visits to keep our spirits up and ward off the cabin fever that was setting in. So if you really want to bless a family after surgery, drop off a gift for the patient when she has been home for two weeks. She will be alert enough to both appreciate and use it. These are the gifts that Emma and I appreciated the most both in and out of the hospital. Small sizes such as 4 to 6 ounces are perfect for taking medications without having a lot of waste. Try to find a variety of flavors. Apple juice and Sprite get boring. One friend brought us Yahoo chocolate drink boxes. Those were a huge hit because they were so unique. This is the absolute best gift I can recommend. We joked about using a baby monitor with Emma, and basically the walkie talkies were the same idea but in grown up teen form. When we first came home, she was very limited in what she could do for herself but I certainly didn’t want to sit by her bed or by the couch all night and day long. She also needed the reassurance that we would come instantly if she needed help. These walkie talkies were a perfect solution. (That link is the exact set that we have, bought from Amazon.) At times when she was too weak to even talk, she used the alarm button to alert us to come help. And as recovery comes, walkie talkies are plain fun to play with. Getting comfortable is a constant struggle. Aim for items with cushy textures that are a distraction from pain. This plush body pillow is an example of the kind of thing that Emma appreciated. As the patient starts drinking more liquids, fun straws are a small diversion. Although they may seem juvenile, this set of disposable cups with lids and straws would have been perfect for all those pills Emma had to take. Emma loved a personalized blanked that some church friends gave her. The texture, colors, and sentiment seemed to bring her great comfort. Load up the iPod with music! A dear friend gave Emma some super soft tiger slippers in the hospital. These were perfect for physical therapy sessions and getting about the room. Again, pay attention to colors and textures. Any positive physical sensation is a distraction from the pain of recovery. Emma complained of a bad taste in her mouth for weeks after her spinal fusion. Butterscotch discs and life saver candies were a big relief. We used surgical tape (of course) to hang up the homemade posters and cards that people brought. During physical therapy, those were something to focus on instead of the pain. These make great motivators to get out of the house and brave the painful bumps of the car. Choose simple kits that provide all supplies needed. These are great for keeping busy while watching television or listening to audio books. Emma is still enjoying the Knot-a-Quilt that a dear family gave her. 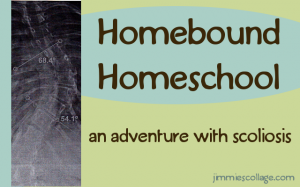 I am happy to say that I’m bringing this homebound homeschool series to a close. 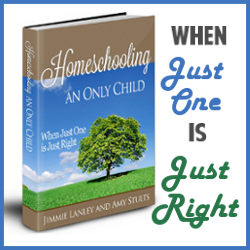 The irony of it is that there isn’t a whole lot of homeschool in these posts. What I’ve discovered is that when you are homebound after a surgery, you need to focus on healing and not on academics. Once the body is whole and the mind is clear of pain medications, then you can expend mental energy to learn. Pushing the learning before that point is counterproductive. It’s just like potty training or teaching a child to read. It will happen when the child is ready and not a day before. My husband had a bike accident last week that is keeping him homebound for a few weeks (he broke both bones in his lower left leg, so he has to stay lying down with his leg elevated pretty much all the time!). He is hanging out upstairs in our house, and we can hardly hear each other even if yelling. So, what we discovered is that you can install a “walkie talkie” app on smart phones. We’re using TiKL for Android, and I think it is probably available for iPhones also. It’s a great way for him to just beep me and let me know what he needs, since we both keep our phones next to us all day. And then the kids have an opportunity to serve as they run ice packs, water bottles and snacks up and down the stairs for him! Something else we needed was a breakfast tray (even when he doesn’t want to sit up all the way, he can set it next to him as a secure place to put food, drinks or his computer) — so if a family with a homebound child or parent doesn’t have one of those, it would make a great gift! I’m glad to hear that Emma is getting better. Thank you for these ideas, I will keep them in mind if I ever need them. This past year I have given a small box of gifts to two relatives who were recovering from cancer treatments. They said that the lip balm, travel tissues and (unscented) hand lotions were very useful, fyi. In one I included pretty, soft, scarf to keep her neck warm and it was one of her favorites. What a wonderful, practical post. I’ll keep all of this in mind as I am sure to need it in the future. (If not with my own kids, then as a visitor.). I do hope she is lots better now! I love this list. It is so true that people tend to not be as present after the initial crisis/trauma/need when it seems like it’s the most needed. Good thoughts. As far as the visitors, I would inquire as to whether the young person is ready. We just completed almost a week of unplanned hospital time. We were there because of excrutiating pain. My teen daughter is very, very social. She said she loved having company because it helped take her mind off of the pain. We all have our own preferences. Good thoughts about ministering to the parents. We had people bring us food. Even one lady who doesn’t connect closely with anyone brought us Subway, large bag of chips, several different fruits, packs of crackers and granola bars. And volunteered to stay with my daughter so my husband & I could go eat. Volunteering to stay with the child while the parent gets out to eat, shower etc. is appreciated, as well as volunteering to get other siblings to their normal activities. The fact about checking in 2 weeks later is applicable to any trauma. 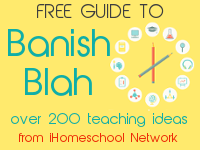 What sound advice and great ideas! I agree that the hospital time is a very busy and stressful time and home visits are often more important and valued. 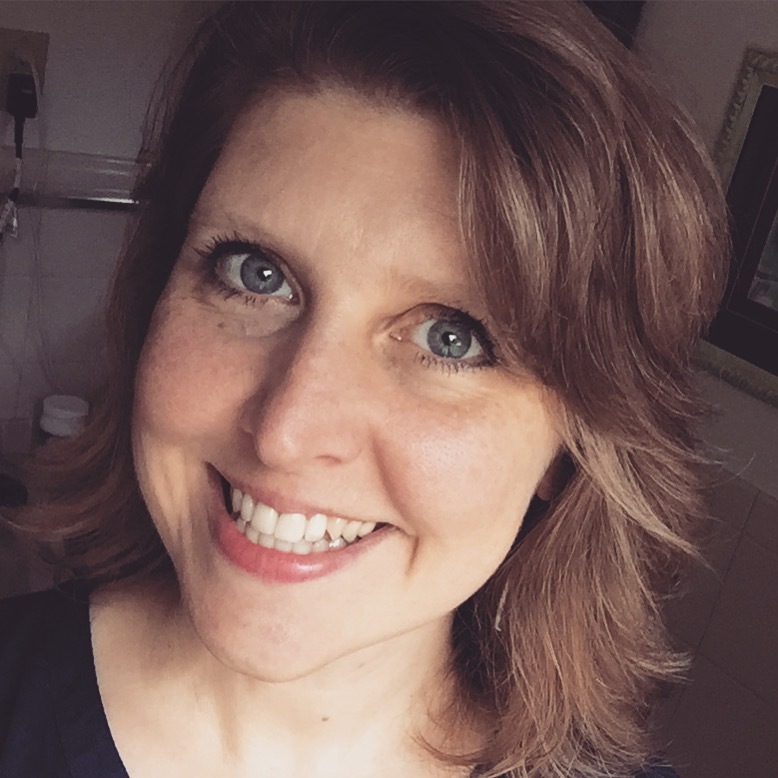 -It helped that the mom was proactive in reaching out and letting us know when/if visits would work/help and what she needed (like some periodic infusions from a nearby Starbucks) to keep her energy up. -This hospital had a TV in the room that inc. a DVD player, we were able to help entertain, distract and educate our friend by reading off our DVD selections over the phone and bringing in the ones that interested her. -Our friends had 3 other children, all younger then the hospitalized teen, and no nearby family. A great ministry to the family was our ability to take their 3 younger kids a for part of the day during the week, this allowed Dad to teach his classes at a college walking distance from both us and the hospital and to go visit and talk to those at the hospital without everyone in tow and also to have the kids close enough that the could go get mom hugs everynight on the way home or have dinner with the parent who would be spending the night at the hospital while the other sat with the patient. I know that our ability to do this took a whole level of worry off the mom who sent in her lesson plans and box of books with the kids and we all did school together! When I was diagnosed with malignant melanoma at the beginning of the year a friend bought Gary and I tickets for a trip up the Thames River (London). It was such a thoughtful present because it would allow us time away from the children to process the news on our own. This is a great post and so practical. Thanks for sharing! Hi, Jimmie and Emma, what a shock to read about the troubles, but how wonderful you deal with it. May both my daughter and I wish you all the very best? 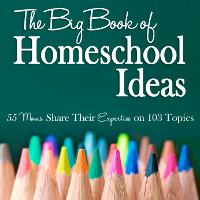 We know you will all quickly recover and share all good advice with the home school community. Jimmie, I think this journey is a hard one but I appreciate the fact that you are sharing it with us. Some of what you have written applies to so many situations we have to face with health issues. I really appreciated this post – it will help us be a bigger blessing to those we minister to! Haha! Some really down to earth advice here! A lot depends on the hospital I suppose, and the amount of time you expect to be in for. I pray Emma is mending well…thinking of you and miss your posts!! Merry Christmas! How is Emma doing? I hope she is feeling well enough to celebrate and enjoy Christmas! My 14 year old daughter just got the same diagnosis with an S-shaped curve, needing surgery on Dec 30th. We had no idea until my sister said “does Hannah’s spine look curved to you?” I shrugged it off that she had poor posture, but he more I looked, the more I knew there was a problem. There were no signs from her physical just a year earlier. Reading the blog was both helpful and terrifying. I’m scared for us all and I appreciate you taking the time you took to share your story. How is she now? Hannah’s worried that she won’t be able to do backbends anymore. And the Wii was a brilliant idea. Hannah wants a puppy. Oh dear. Emma is great. She never was a very sporty kid, so backbends are not a problem. I have no idea if that’s possible after spinal fusion. But the advantages outweigh that small sacrifice. 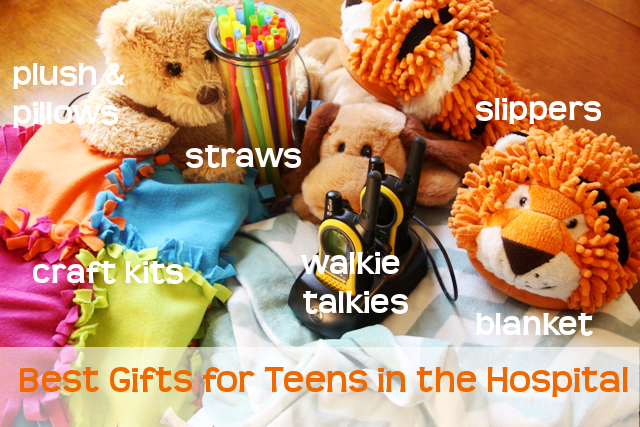 Thanks for the tips on what to get a teen in the hospital. A young friend of mine was admitted and I didn’t know what to get her – I ended up buying her a nice cozy blanket and I think she likes it. These suggestions are very helpful! Especially the reminder that most people in the hospital are not up for visitors. Great Ideas! I’m going to get my son’s 12 year old friend (who will be in the hospital for at least a month) a lap desk with a pillow cushion, some puzzle type books, colored pencils (don’t for get the sharpener), bendie straws, gum/candy, and iTunes cards. Thanks for the suggestions! I hope every one gets well soon! My 17 year old grandson is facing surgery for a complete fracture of the neck. He has been immobilized for 6 weeks in hopes it would heal but it has not. Thankyou for your article and all the comments. We feel at loss as to even simple things to bring him so these little ideas are helpful. He can only move a little now and it will be even more difficult after this surgery. I would welcome any additional ideas. !